Collect Ripe Winnings with a 100% Match Bonus + a $33 Free Token! Harvesting Sloto’Cash wins has never been as easy! 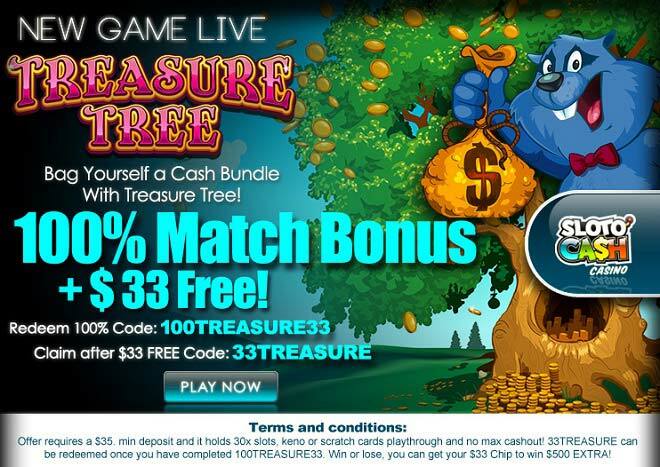 Play our new slot Treasure Tree that will help you collect more winnings when you deposit as little as $35 to claim a 100% Match plus a $33 Free Play chip! It’s going to be a winning season when you play the one-of-a kind Treasure Hunt slot with a “Match & Win” feature that allows you to collect huge riches with juicy winning combinations. Match three of a kind symbols in the same colored bags and claim up to 25 Free Games or multiply your initial bet up to 500 times in instant prizes. Plant even more riches as these prizes will have tripled winnings in any Free Games that are awarded. Pick up incredibly juicy winnings when you play Treasure Tree and collect a 100% Match + a $33 Free Play Chip when you deposit as little as $35!